My Pebble Garden has rockery plants interspersed with pebbles and cobbles. Photographed today. I'm pleased with this part of my back garden. I made it a couple of years ago. You have created wonderful area Terra. I would be pleased too. Good work. It worked out better than I had expected. Lol. This is absolutely the most tidy pebble garden I have ever seen, TT, lol. What does actuallu cobble mean? It shows me the same translation as pebbles. Cobbles are very large pebbles, often used in the past to cover pavements and streets. that's a pity you had sleet..
Today was bright, warm and sunny .. ...sigh....I am pining for the sun now TT. I have a terrible feeling that this is going to be another non-summer. Scott and I are learning Spanish....seriously...can't take this for the rest of my days. Let's hope for a sudden and dramatic improvement...there's always hope! 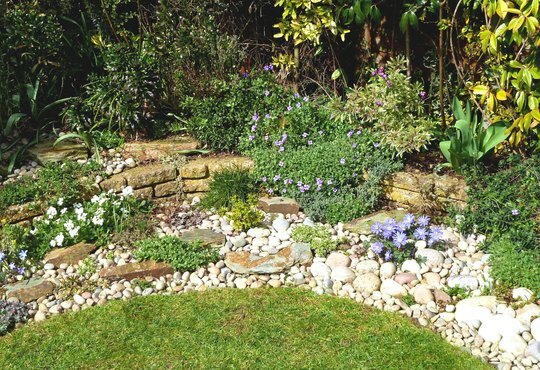 Looks very nice I like using different size pebbles in the garden, lovely to see the rockery too. Wonderful combination of soft and hard landscaping. I take it you are not a professional gardener but you could knock some of the TV pundits off their perches, with a little help from your staff of course. How pretty this area is Tt. So neat and tidy. I hope you are proud of it....you should be. this is a sheltered, sunny area of my garden. That looks really good Terra, but then all your garden does! Oh! That is really lovely.......and the sun is shining. My 'strip' looks bare, Terra, but your's, rain, snow or shine always looks great! Have you done some sort of deal with the 'wee folk'? Lol. My advice would be to trust your own judgement. Deals with folk are not good ..
That is lovely! Some nice ideas for the memory bank! BTW how do you get the musical notes characters Terratoonie? Yeah, given me a couple of ideas as well!